The adventure follows the journey of title character Bilbo Baggins, who is swept into an epic quest to reclaim the lost Dwarf Kingdom of Erebor from the fearsome dragon Smaug. Approached out of the blue by the wizard Gandalf the Grey, Bilbo finds himself joining a company of thirteen dwarves led by the legendary warrior, Thorin Oakenshield. Their journey will take them into the Wild; through treacherous lands swarming with Goblins and Orcs, deadly Wargs and Giant Spiders, Shapeshifters and Sorcerers. Although their goal lies to the East and the wastelands of the Lonely Mountain first they must escape the goblin tunnels, where Bilbo meets the creature that will change his life forever…Gollum. Here, alone with Gollum, on the shores of an underground lake, the unassuming Bilbo Baggins not only discovers depths of guile and courage that surprise even him, he also gains possession of Gollum’s “precious” ring that holds unexpected and useful qualities … A simple, gold ring that is tied to the fate of all Middle-earth in ways Bilbo cannot begin to know. 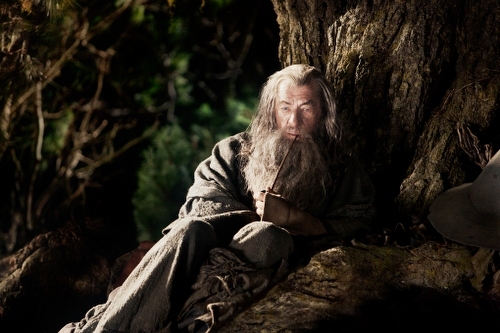 Ian McKellen returns as Gandalf the Grey, the character he played in “The Lord of the Rings” trilogy, and Martin Freeman in the central role of Bilbo Baggins. Also reprising their roles from “The Lord of the Rings” movies are: Cate Blanchett as Galadriel; Ian Holm as the elder Bilbo; Christopher Lee as Saruman; Hugo Weaving as Elrond; Elijah Wood as Frodo; Orlando Bloom as Legolas; and Andy Serkis as Gollum. The ensemble cast also includes (in alphabetical order) Richard Armitage, John Bell, Jed Brophy, Adam Brown, John Callen, Luke Evans, Stephen Fry, Ryan Gage, Mark Hadlow, Peter Hambleton, Barry Humphries, Stephen Hunter, William Kircher, Evangeline Lilly, Sylvester McCoy, Bret McKenzie, Graham McTavish, Mike Mizrahi, James Nesbitt, Dean O’Gorman, Lee Pace, Mikael Persbrandt, Conan Stevens, Ken Stott, Jeffrey Thomas, and Aidan Turner. 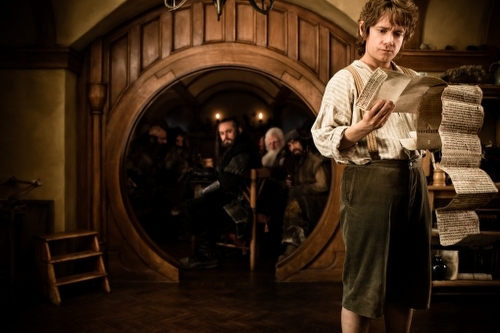 The screenplays for both “The Hobbit: An Unexpected Journey” and “The Hobbit: There and Back Again” are by Fran Walsh, Philippa Boyens, Guillermo del Toro and Peter Jackson. Jackson is also producing the films, together with Fran Walsh and Carolynne Cunningham. The executive producers are Alan Horn, Ken Kamins, Toby Emmerich and Zane Weiner, with Boyens serving as co-producer. Under Jackson’s direction, both movies are being shot consecutively in digital 3D using the latest camera and stereo technology. Filming is taking place at Stone Street Studios, Wellington, and on location around New Zealand. Among the creative behind-the-scenes team returning to Jackson’s crew are director of photography Andrew Lesnie, production designer Dan Hennah, conceptual designers Alan Lee and John Howe, composer Howard Shore and make-up and hair designer Peter King. The costumes are designed by Ann Maskrey and Richard Taylor. The score is being composed by Howard Shore. Taylor is also overseeing the design and production of weaponry, armour and prosthetics which are once again being made by the award winning Weta Workshop. Weta Digital take on the visual effects for both films, led by the film’s visual effects supervisor, Joe Letteri. Post production will take place at Park Road Post Production in Wellington. “The Hobbit: An Unexpected Journey” and “The Hobbit: There and Back Again” are productions of New Line Cinema and MGM, with New Line managing production. Warner Bros Pictures is handling worldwide theatrical distribution, with select international territories as well as all international television licensing, being handled by MGM. “The Hobbit: An Unexpected Journey” will be released beginning December 14, 2012. The second film, “The Hobbit: There and Back Again,” is slated for release the following year, beginning December 13, 2013.